In a few weeks, my grandmother will turn 95 years old. In a couple of days, my son will celebrate his first birthday. I often think about the changes the world has undergone in my grandmother’s lifetime. I can’t even imagine what my son’s world will look like 95 years from now. Among the many changes my grandmother has lived through is the advent of zoning. The New York City in which she was born in 1919 was just beginning to experiment with zoning. Three years prior to her birth, New York City passed a zoning resolution to stop tall towers from preventing air and light from reaching the streets and neighboring residences below. The resolution put restrictions on heights, established setbacks, and restricted towers to a percentage of the lot size. None of these requirements seem particularly revolutionary today, but at that time in the United States they were. It was also around this time that cities began to look at ways to separate different types of land uses. In an era where people frequently lived in close proximity to the heavy industrial facilities in which they worked, there were growing concerns about health and safety impacts. Creating zones that allowed and prohibited certain uses on a parcel of land became a tool to address this. The notion that local governments could place limitations on private development wasn’t without controversy and was soon challenged. In 1926, the U.S. Supreme Court ruled in Village of Euclid, Ohio v Ambler Realty Co. that the use of zoning to separate land uses was constitutional. Cities around the country, including here in Portland, were quick to adopt “Euclidean zoning” – the segregation of land uses. If all of this seems like ancient history, I am here to tell you it is very much still relevant today. As Portland works on updating its Comprehensive Plan, the mixing of land uses is at the front and center of the city’s vision for how it would like to grow over the next couple of decades. Instead of looking at ways to separate uses, Portland is looking to find a better way to mix uses. This doesn’t mean an industrial complex is coming to your neighborhood, but it does mean that in the Portland of the future you may see a greater mix of residences, commercial, and other businesses along your main streets and corridors, and in your town centers. We’ve begun to see this on streets like SE Division and N. Williams. This type of compact, mixed use development ultimately advances city and regional goals such as putting more destinations and services within walking distance of homes, increasing housing options, and accommodating regional population growth without expanding the urban growth boundary. It also raises challenges around issues such as design compatibility with existing neighborhoods, automobile parking, and livability impacts like noise. The development boom of the past few years offers a window into the future. It also offers an opportunity for neighbors, developers, and city planners to talk about what is working and what isn’t working. This conversation is taking place at various levels, most importantly in the Bureau of Planning and Sustainability’s Mixed Use Zones project. The project will result in zoning code changes along the corridors and centers where much of the city’s future development will be built. Portland currently has nine zones that allow for mixed uses. These zones were developed two decades ago and reflect a more auto-oriented, lower intensity commercial approach than envisioned in the draft Comprehensive Plan update. The Mixed Use Zones project is looking at reducing the number of mixed use zones to four and changing the zoning code to better address issues like building size, transitions between commercial properties and single family homes, and ground floor uses. Small, medium, and large: The concept is to have four zones that offer varying degrees of intensity and height depending on where the site is located. Dispersed commercial areas like the node around SE 28th and Stark would be zoned at a small scale. Corridors such as SE Division would be zoned at a medium scale. Civic corridors like SE Powell would be zoned at the largest intensity. This approach also may take into account the size of an adjacent street. A four story building next to a narrow street can feel a lot different than the same four story building adjacent to a wide street. Transitions and buffering: One challenge that Portland faces is that our corridors and main streets are not very deep. This leads to commercial buildings that are adjacent to lower density single family homes. Current code doesn’t do much to address the transition between the two leading some buildings to loom over neighboring houses. The Mixed Use Zones project is looking at concepts like setbacks, height transitions, and buffering to ease the transition. Street level design: One of the project’s goals is to improve how mixed use buildings interact with the street at the ground level. The project is looking at things like allowing buildings to be three feet taller if that extra space is dedicated to the height of the ground floor, increasing requirements for windows at the ground level, and removing current zoning barriers that make it difficult to develop buildings with outdoor spaces. Incentives: The project is examining ways to incentivize things like affordable housing, sustainable features, and historic preservation. This would likely take the form of offering developers additional height or building sizes in exchange for the desired amenities. 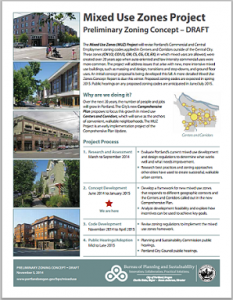 Portland currently has limited zoning code incentives related to historic preservation and ecoroofs. Neighborhood contact: For most parts of the city, there is currently no requirement for developers to notify neighborhood associations about new mixed use projects. The Mixed Use Zones project is considering expanding the notification process. The concepts are currently being tested for feasibility before new zoning code is developed in early spring. The proposed codes will be presented at public hearings before the Planning and Sustainability Commission and the City Council in mid-to-late 2015. The project’s advisory committee meets on the third Wednesday of each month from 4-6pm at 1900 SW 4th Ave, Suite 2500. Committee meetings are open to the public. You can also sign up to receive updates and submit your thoughts here.